I'm currently leaning toward the one on the right, by the way--which, according to the folks at play-asia.com, is the "Postman Version." 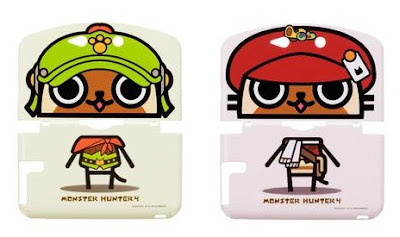 Should any of you want to purchase one or both of these adorable 3DS LL/XL "face covers," the "Postman Version" can be pre-ordered here, while the "Otomoairu Version" (the green one) can be pre-ordered here. Oh, and both will set you back just $19.90 (apiece) when they're released on Sept. 14. I like the Otomoairu version. That li'l scarf is adorable! YES. Just YES! I've got a T-shirt with the Postman Felyne plastered on it. Bought it from Uniqlo.